According to Reuters, the announcement came at a joint appearance by Chrysler Chief Executive Sergio Marchionne and EPA Administrator Lisa Jackson. This is not the first mention of this technology by the EPA. Fact is, hybrid hydraulic technology is not new, in that it has been used in trucks as far back as the 1960s . Moreover, the U.S. Environmental Protection Agency in Ann Arbor, Michigan, has been actively testing hybrid hydraulics since the early 1990s. Partners in the past have included Ford, Parker Hannifin and Eaton Corp. The goal has been to design, build and field-test prototype vehicles which will one day replace inefficient, heavy vehicles. Another fact is, large and heavier vehicles like trucks and buses, as well as military transports, construction and dock-loading equipment, burn a lot of fuel. Hydraulic systems can store and discharge energy much more efficiently than electric batteries; meaning, they store and discharge energy much faster, providing 10 times the power in the same size and space as a hybrid electrical system. According to the EPA, Parker Hannifin's new RunWise hydraulic system has demonstrated up to 50 percent fuel reduction compared with the latest, most fuel-efficient conventional garbage trucks. Furthermore, it has shown the ability to recover up to 75 percent of the energy the vehicle expends in braking by pumping it back into the accumulator. A gas-electric hybrid system only recoups about 15 to 20 percent. Electric cars indeed have limitations, and one of them is scalability to larger, more powerful vehicles like trucks. Think garbage trucks and delivery trucks where the power requirements are immense by comparison. Now think hybrid hydraulics as a potential technology solution; and now toward a mini-van. For the record, Scientific American covered this subject months ago, but no local papers or news agencies covered this technology advance. 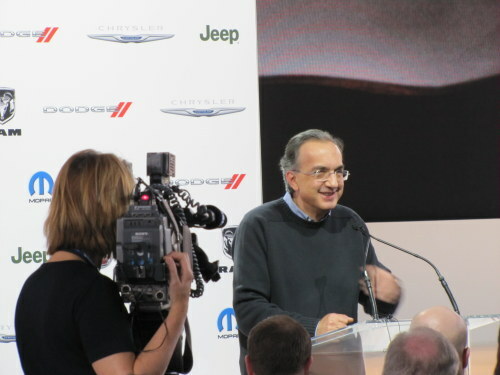 It seems the Detroit area was still stuck in electric mode; that is, until Marchionne spoke up.